Named for the an elevated archeological site called Fort Ancient (located north of Cincinnati), this cultural group includes the most encompassing of all the ancient Ohio cultures and is most likely made up of descendants of both the Adena and Hopewell cultures. The were known to have had a number of circular or rectangular houses that surrounded an open plaza. They too built small burial mounds near where villages have been located. 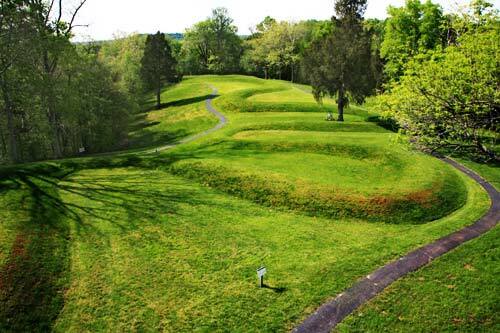 It is believed that the Fort Ancient Culture may have built the distinct Serpent Mound located in Adams County. The Fort Ancient culture was most likely a transitional group of people from the pre-historic Hopewell Culture and the tribal Native American Indians that Europeans came in contact. It has been calculated that they were in Ohio for about 700 years and seem to have suddenly disappeared about 100 years before Native Americans came into Ohio around 1700. We call this group of Late Prehistoric people as a Fort Ancient Culture, because it appears they developed a large population in southwestern Ohio, occupying a former Hopewell site high above the Little Miami River. This massive group of earthworks has the distinct impression as being some type of fortification and is unlike other earthworks common to Ohio. Whether or not it was a fortification is open to highly speculative debate. Visitors to the site are immediately struck by how high up the location is above the Little Miami River. The cliffs surrounding the site are extremely steep and the earthworks mostly follow the terrain as opposed to being a series of geometric shapes. So far archeological studies of the site do not give any evidence the location housed any Hopewell Indians inside the walls. Down in the valley below the walls of Fort Ancient, there have been found numerous locations that indicate the presence of several Hopewell villages. The reason given by most archeologists against the idea that this was not a fortification is the fact that there are a large number of gaps in the walls that would seemingly allow for easy access by attacking forces. However, these actually seem to be choke points, that would direct foes into pre-determined points of entry. Instead of having to defend the entire 3+ miles of walls, the defenders could concentrate their defenses on just these entry points. As an enemy advanced on the crest of the hill, they would not know that the walls were even in place because the walls would look no different than the rest of terrain. What they would see as they struggled up the steep cliffs were the the low points in the terrain (the gaps in the wall) and would advance towards them. I believe the defenders would be keenly aware of where they would be advancing and set up kill-zones in these areas. Whether or not this describes the construction of the site correctly or not, is completely open to supposition. We may never know for certain the reason the site was constructed in such a manner. However, as a student of military engagements, it appears this location has many qualifications as being a defensive structure.